under commercial interests or emotional needs? There was no great plan involved at all. Alexander, Jean-Pierre, and La Dominika have always been close friends and we basically met and had a chat last fall and then decided that the time was right in 2013 for us to get reunited. If anything, we are motivated by politics this time around. Times are really tough for LGBT people in many parts of Europe, antisemitism is also on the rise, and we believe Army Of Lovers need to be back at the forefront in the struggle for equal rights regardless of race or sexual orientation. De St Tropez. Or new material will have other special concepts? There are four brand new songs on the "Big Battle Of Egos" album released March 27 - "Rockin' The Ride", "Crashing Down", "Tragedy", and new single "Signed On My Tattoo" (a duet with Gravitonas) - but we feel so inspired that we might release even more new material in the fall, including both brand news songs and re-recordings of some Army Of Lovers classics. They will definitely applaud La Dominika. She will always be with us since she is a permanent member of the Army Of Lovers line-up. La Camilla however has been altered into Santa Camilla, she is now our official saint but will not go with us on tour. We will see about Michaela Dornonville de la Cour, she might be the joker in the whole game of cards. album, or, maybe it will have new big history? We actually have no idea and have decided not to make any further decisions before we really have to. The future is open. Lovers of will be perform with Gravitonas and Army of Lovers at once? Gravitonas is very much happening. Gravitonas has a new single out in the United States called "Incredible" which is receiving tremendous early support especially from the dance music community (perhaps not surprising considering the fact that Gravitonas have already had three Top 30 Club Chart hit singles in the U.S., including "Everybody Dance", our duetv with Roma Kenga) and also now a hit single in France called "Brighter", a duet with French DJ Guena LG. Also, the Army Of Lovers single "Signed On My Tattoo" is a duet with Gravitonas, so you are likely to see a lot of Alexander (and Andreas) in the nearby future. Gays are constantly discriminated against in Russia, not only in the streets and the media, but even worse, through the law. The new homophobic laws against "homosexual propaganda" terrify us. 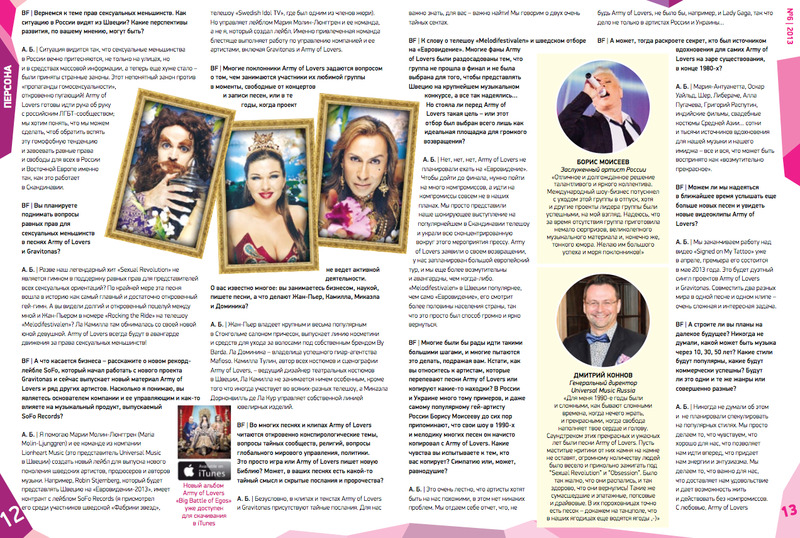 Army Of Lovers want to work closely with the Russian LGBT community to see what we can do together to reverse the homophobic trend and fight for equal rights and liberty for LGBT people in Russia and Eastern Europe, the way LGBT people already enjoy equal rights in Scandinavia. Isn't "Sexual Revolution" the ultimate gay rights campaign song? It is at least the song ever recorded that was been used the most as a Gay Pride Anthem. And did you see the kiss between Alexander and Jean-Pierre in the Melodifestivalen performance of "Rockin' The Ride"? La Camilla hanging out with her new young girlfriend? Army Of Lovers will always be at the forefront of the gay rights movement. Alexander helped Maria Molin-Ljunggren and her staff at Lionheart Music set up the new SoFo Records label to bring out a new generation of Swedish pop stars, producers and songwriters. Robin Stjernberg, who will represent Sweden at this year's Eurovision Song Contest, is a SoFo Records signing (following Alexander having found Robin during his involvement as a judge on the Swedish Idol TV show). But it is Maria and her staff and not Alexander who run the record label and they're doing an amazing job for the SoFo Records artists, including Gravitonas and Army Of Lovers. Jean-Pierre runs a major hair salon in Stockholm and a make-up and haircare products line called By Barda. La Dominika runs a PR agency called Mafioso. Camilla Thulin, who designs all the Army Of Lovers outfits and scenography, is Sweden's leading theater costume designer. La Camilla is not doing much besides being on the occasional TV show, while Michaela Dornonville de la Cour is busy running her own jewelry line. tracks is some kind of new Bible? Maybe there's hidden messages? There are definitely hidden messages everywhere, both in Army Of Lovers and in Gravitonas. These are for us to know, and for you to find out. We are talking about two very secretive sects here. selection was just a way to "beautiful comeback"? No no no, Army Of Lovers never planned to perform at the Eurovision Song Contest. To win at Melodfestivalen we would have had to compromise far too much but this is not what Army Of Lovers are about. Instead we made a shocking performance at Melodifestivalen, stole the media limelight from all the other artists, and are now ready to go on tour around Europe. Army Of Lovers only performed at Melodifestivalen to tell everybody that we are back and we are more outrageous and avantgarde than ever before. Melodifestivalen is such a big TV show in Sweden (over half the country's population are watching) so it was the perfect spot to stage the comeback, that's all. It is flattering that other artists are copying Army Of Lovers. We don't have a problem with that at all. There would never have been a Lady Gaga if there had not first been an Army Of Lovers, so it's certainly not just Russian artists who copy our style. Marie Antoinette, Oscar Wilde, Cher, Liberace, Alla Pugacheva, Rasputin, Bollywood movies, Central Asian wedding costumes, we have thousands of references and inspirations in our music and image. Anything and everything camp and outrageous is fine with us. other new songs? Will there be any videos of them? We plan a video shoot for "Signed On My Tattoo" in April, the video to be premiered in May. It's a duet between Army Of Lovers and Gravitonas so writing the script and making the video will be an interesting challenge. We have absolutely no idea and we never speculate anyway. We just do what feels right for us to do and then we go ahead and do it with full energy and enthusiasm. This is what is important to us. To have fun and to be uncompromising.